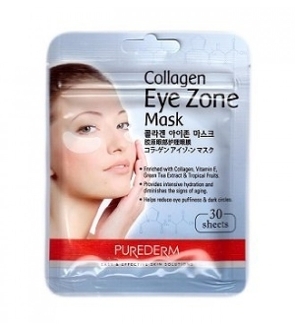 Collagen Eye Zone Mask is enriched with Collagen, Vitamin E, Green Tea Extract & Tropical Fruits to provide intensive hydration and diminish the signs of aging. These amazing sheets help reduce eye puffiness & dark circles. Each pack contains 30 sheets/ 15 applications. These sheets come in a resealable bag. Directions for use: Wash Face. Apply a sheet under each eye for 10-15 minutes then remove.